Use: A Currency Swap is the best way to fully hedge a loan transaction as the terms can be structured to exactly mirror the underlying loan. It is also flexible in that it can be structured to fully hedge a fixed rate loan with a combined currency and interest rate hedge via a fixedfloating cross currency swap. In a non-deliverable swap (NDS) there is no physical exchange of the two currency flows. 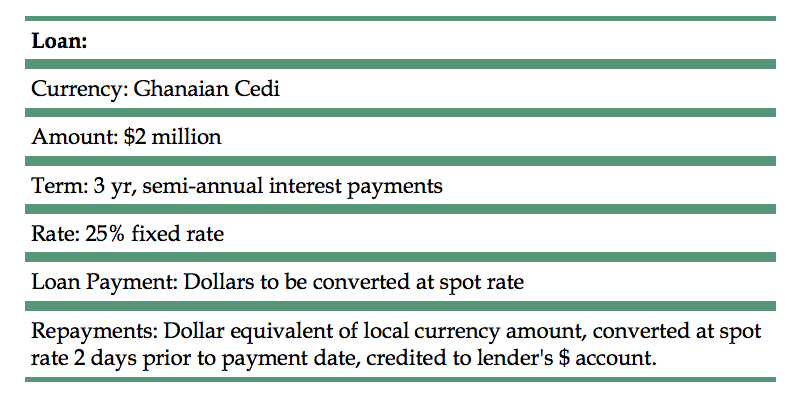 Instead, the USD equivalent of the local currency payment (determined at the spot rate on the date of the payment) will be set against the opposite USD payment, with the net paid to the appropriate party. NDSs are used to avoid transfer risk and to avoid the cost of local market exchange. MFX will contract primarily on an NDS basis. Initial exchange: The MIV makes the initial loan in local currency or in dollars which the MIV immediately exchanges for local currency. Periodic Exchanges: The MIV receives local currency repayments (or the USD equivalent) on its local currency loan and pays them to MFX while retaining its profit spread. In exchange it receives a dollar payment at the agreed LIBOR rate. Final Exchange: The MIV receives the principal repayment in local currency (or USD equivalent) and pays it to MFX. 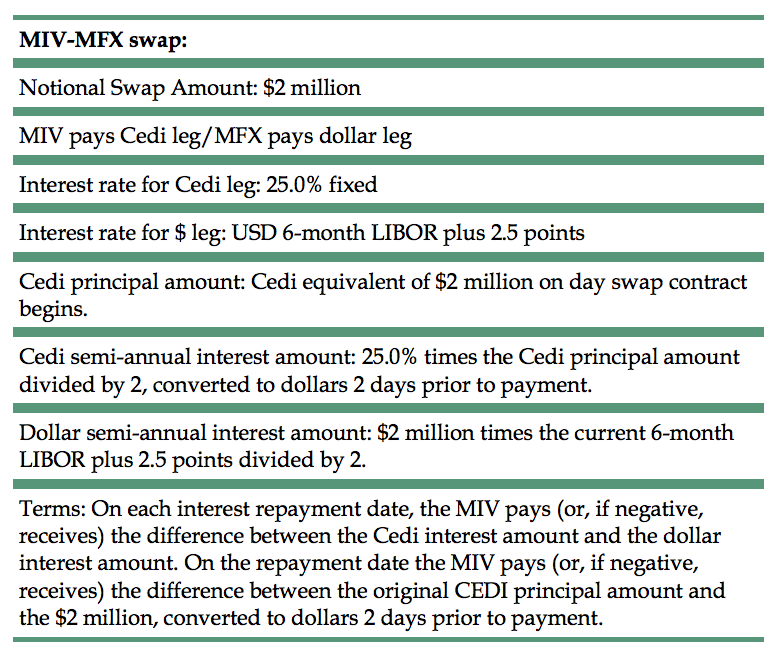 MFX pays the MIV the dollar amount calculated at the initial exchange rate for the start of the contract. Initial Exchange: The MFI exchanges the principal of the loan in hard currency for a local currency principal amount with MFX. The exchange of principal is done at market rates i.e. the spot rate as of the effective date of the swap. Periodic Exchanges: Over the life of the loan, the MFI makes interest payments on the local currency principal amount to MFX, and in exchange receives the interest amounts due on the hard currency loan. Final Exchange: At maturity, the MFI repays the principal amount in local currency to MFX and in turn receives the hard currency principal amount owed to its lender at the same exchange rate that is used for the principal at the inception of the swap. Pricing: For a floating-floating currency swap where only the exchange rate is hedged, a market exchange rate (typically, the spot rate as of the effective date of the swap) is used to convert the payment amounts of the local currency into the target currency. The same exchange rate is used for the final principal exchange in the swap. Interest rate swap terms (fixed for floating) are set so market participants are indifferent between paying (receiving) this fixed rate over time or paying (receiving) a rate that can 3 fluctuate over time. Therefore at origination, the value of the swap equals zero and the present value of the two (expected) cash flow streams equal each other. The following formula calculates a theoretical rate (known as the “Swap Rate”) for the fixed component of the swap contract. Measuring the current market value of an interest rate swap can be complicated as it involves determining a discount rate, a yield curve and a swap rate. Market variables that affect swap pricing include changes in the level of interest rates, changes in swap spreads, changes in the shape of the interest rate yield curve, and exchange rates. MFX will use standard valuation models for valuing interest rate swaps that match the valuations on its matching swap contracts with TCX and bank counterparties. MFX’s preferred transaction scenario is a non-deliverable swap with all payments made on a net basis in dollars/euros offshore with the client on one side and TCX on the other. MFX will also develop the capability to do deliverable swaps where it will assume transfer risk and conversion costs. There will be some pricing adjustment for deliverable swaps which will be directly related to the additional costs MFX incurs and the level of transfer risk in the transaction. The following example assumes the MIV lender also structures a local currency loan payable in dollar equivalents but this is not required if the MIV prefers to assume the conversion risk.